Can I add, remove and/or move specific columns in the main tabs view? Can I add and/or remove a column? Absolutely. When you first login you are presented with the default view for the different tabs (People, Link Partners, Media Outlets, Links). You can easily customize what metrics are visible in the different tabs. 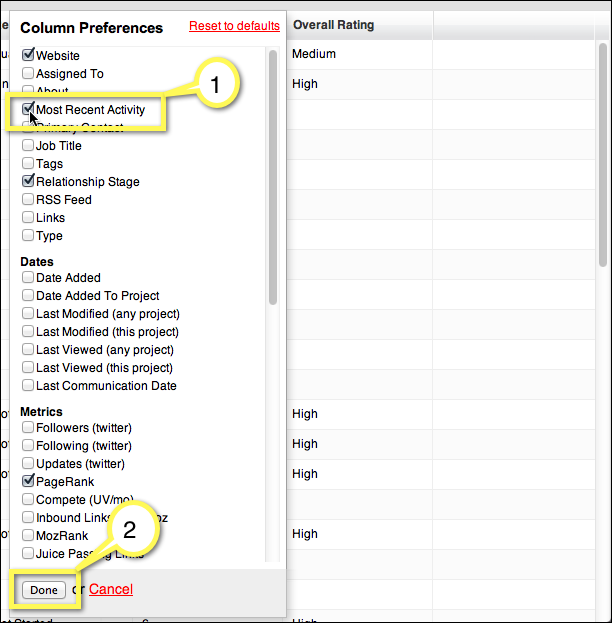 First select 'Columns' in the main navigation. You'll get a light box that shows you all the columns options you have for this tab organized by the type of field. 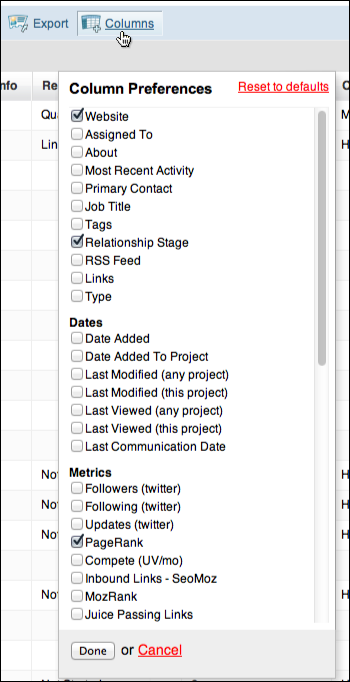 To add or remove a column, use the check boxes to select or remove the data you want presented in each columns. If you want to add a column check the box to the let of the Column name, if you want to remove a column uncheck the box. For this example we're going to add the column "Most Recent Activity" to the tab. Once we we've checked the box for the field , we go to the bottom of the columns box and click 'Done' to close the columns tools and return to the tab you were working in. The new column has now been added to the right of the existing columns. How do I change the Column order? You can drag and drop the column to the exact location you want it be. Click on the column you want to move and drag it to the position you want it to appear. To set the column in place - drop it where you want it.